This trip involved spending a couple of weeks in Denmark before heading for Lithuania Latvia and Estonia via Germany and Poland. The plan involved heading up to Estonia fairly quickly and then slowly working our south and coming down through Poland Germany Belgium Holland and France to Calais and the Tunnel. We had no great expectations about the Baltic States and so were very pleasantly surprised with what we found and had a wonderful trip.We were away for 58 days and spent about 900 euro on camping sites.We took DFDS ferry to Denmark and then Eurotunnel back to UK at the end of the trip. Favourite beer nibbles: Parnu in Estonia, crispy potato skins with garlic mayo and something called grissini but like a pencil sized spring roll. 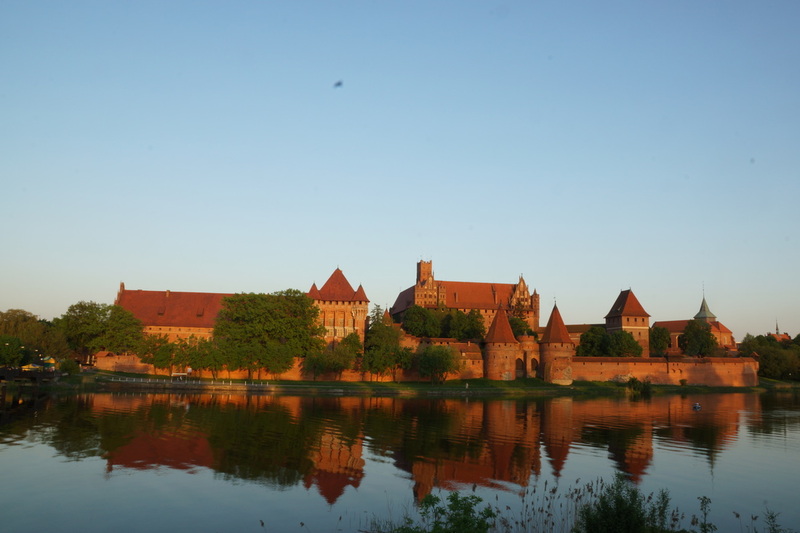 Favourite castle: Malbork in Poland. Best beer: anywhere in Latvia Lithuania Poland Estonia where it is also reasonably priced. Best bread: Poland & Germany, lots of variety in crustiness and flavour. Most expensive coffee: in Aarhus Denmark, over 5 euro each. Most extravagently decorated church: any Orthodox Church, they are all OTT and wonderful. Beautiful moment: when our Lithuanian hitchhikers serenaded us with their beautiful voices and accompanying dulcimer. This trip is all about visiting the Baltic States but of course this involves us first going through Germany and Poland. In Germany we stopped only the once and we parked at the sports centre stellplätze in Lübeck which has 36 places, electricity, access to good toilets, all for €9, showers €1 for 5 minutes, and the sports centre even had flyers in English giving information on the stellplätze, the way into town, and the centre's menu. If only towns in Britain could match this sort of service to motorhomes. We were able to cycle the couple of miles into town, cycle lanes again. 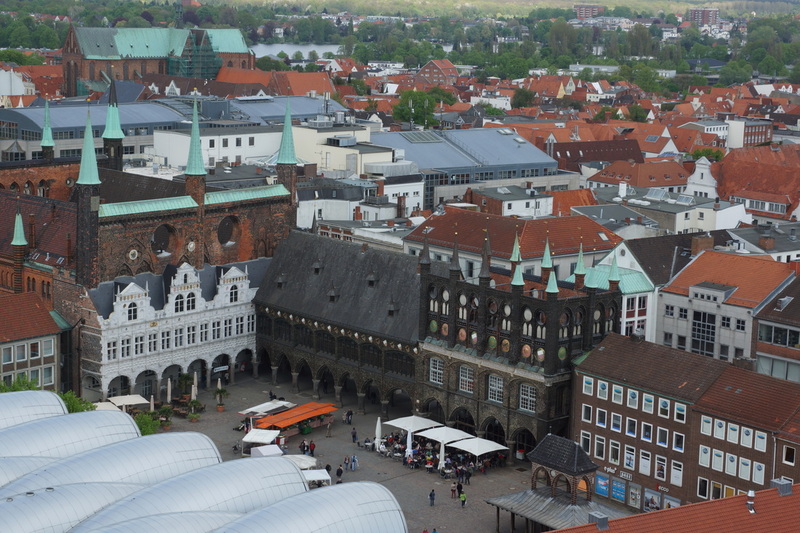 Lübeck was the centre of the old Hanseatic League which was a group of trading ports around the North Sea that worked together for their mutual benefit and protection. It was formed in 13th century before there were functioning governments or national armies, it's been described as the NATO of its day. It was impressive too, it thwarted pirates and even formed an army that defeated the Danish King Valdemar. Kings Lynn in UK is the only British Hanseatic Port. 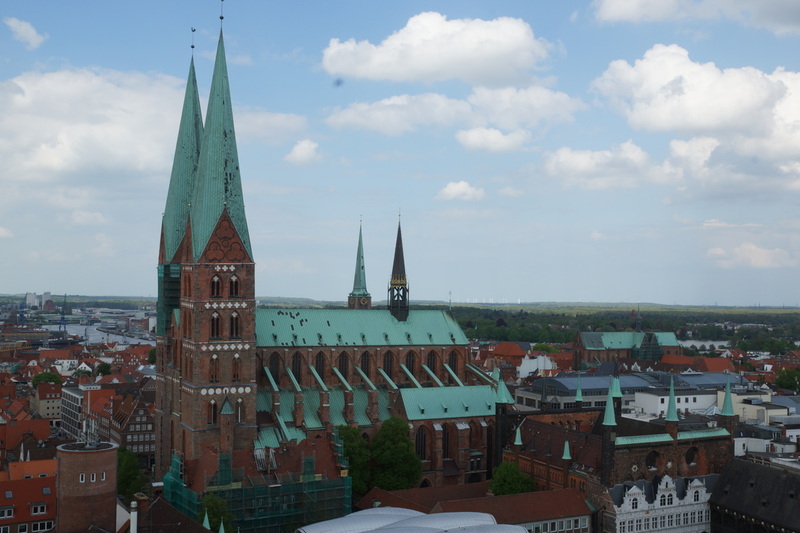 The books said that Lübeck was beautiful and it did not disappoint. Spectacular old buildings in splendid style – the town gates and the old herring-salting buildings were especially fine, and the cathedral tower had a lift (all those stairs are a bit knackering) with good views from the top. And to top it all the city's food specialisation is marzipan and the two storey Niederegger store devoted to it, which went down well with us. From Lübeck we took the motorway across Germany to Camping Marina in Szczecinjust over the Polish border. A lovely little site, with free and powerful wifi, grass pitches, a restaurant, log-cabin chalets and – as the name suggests – a marina. We found this site in the Camping Cheque book. with two big beers. It became clear that with the campsite so quiet the restaurant opening times were, shall we say, a little flexible. As there was a slipway into the marina a short distance away - we decided to try out the blow up kayak for the first time. 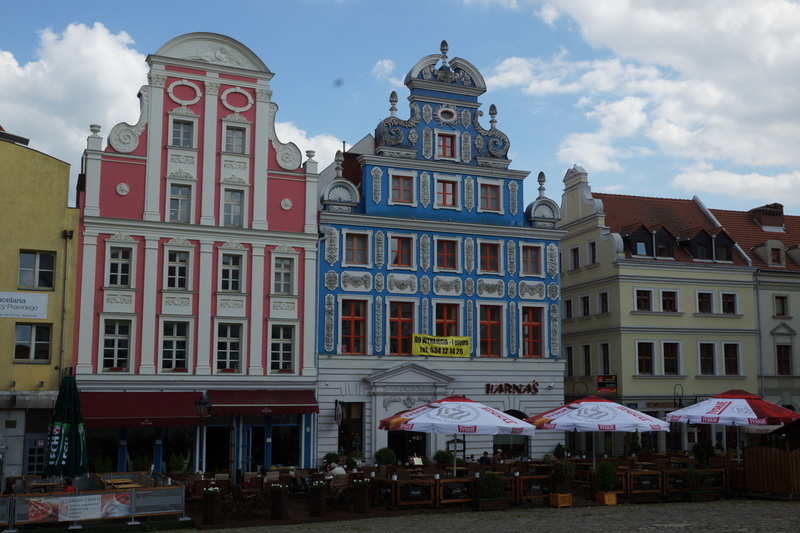 It was then that we discovered that we had not brought the right pump – we needed the type that blows up airbeds, not the vehicle tyre type so instead we decided to go into Szczecin for a couple of hours. Szczecin is another Hanseatic port. While it is part of Poland now it has been part of Germany and in the 17th century was overrun by Swedes. Our trip into town involved a bus and a tram, the bus was so old that not only had the double glazing "blown" but there was a large amount of water in between the two plates of glass - all we needed were a few little fish and it would have made a nice miniature aquarium for the drunks on the back seat to enjoy. Having said that the next bus was very smart and the fare was very cheap. 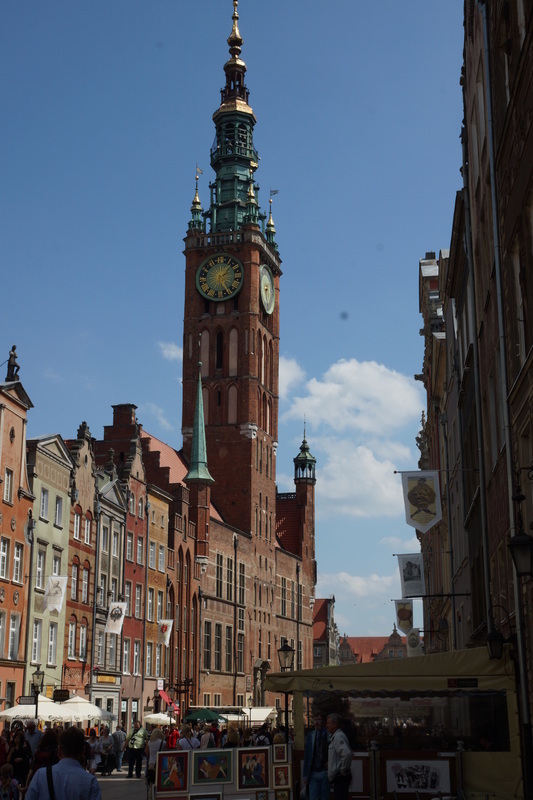 Gdansk is another Hanseatic port and has had a very chequered history. After WW1 it became a free city governed by the League of Nations and it was badly damaged during WW2. We stayed at Camping Stogi which we found in the big ACSI book. OK facilities but we were basically in a car park with very limited space, most of the site seems to be given over to permanent caravans. However there were toilets, showers and a washing machine. The saving grace was that it was next to the tram terminus (Zl3 per ticket) which took us straight into the wonderful old medieval city. The young girl in reception at the site was extremely helpful in selling us tickets but explaining where to go and where to get on and off the tram. 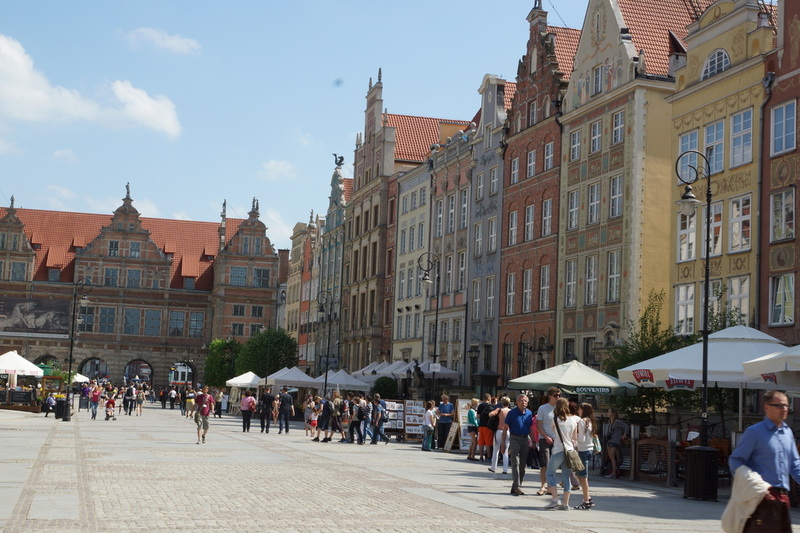 Gdansk old town is very extensive and is full ofexceptional streets, squares and buildings. 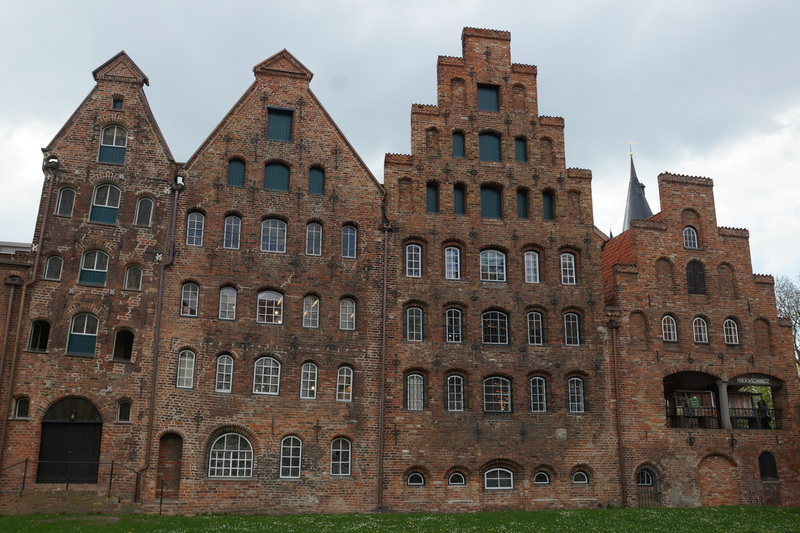 It was such an impressive old town that it was surprising to discover that what we were seeing were restored buildings, bricks having come from Malbork (see below). 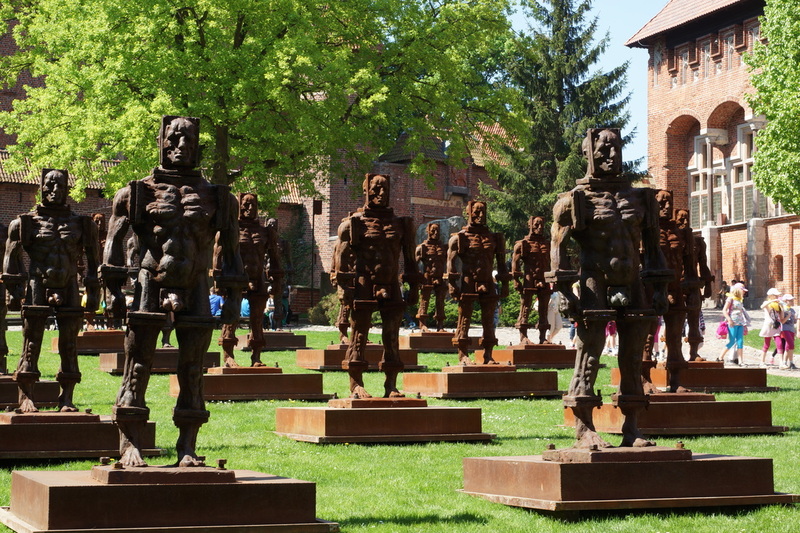 Most of us know Gdansk because of the shipyards and Solidarity - sadly the shipyards are now defunct but the city is a real surprise and well worth a city break visit if you cannot come here for a longer visit. Lots of hotels, restaurants and bars as well as interesting architecture. Highlights included the Green Gate, the Grand Mill (the largest industrial building in Europe at the time), the Crane (the largest port crane in Europe at the time), St Mary’s Church (a knackering 400 steps to the top of the tower, but excellent views over the city), Dutch-style houses and a very fine old Town Hall. 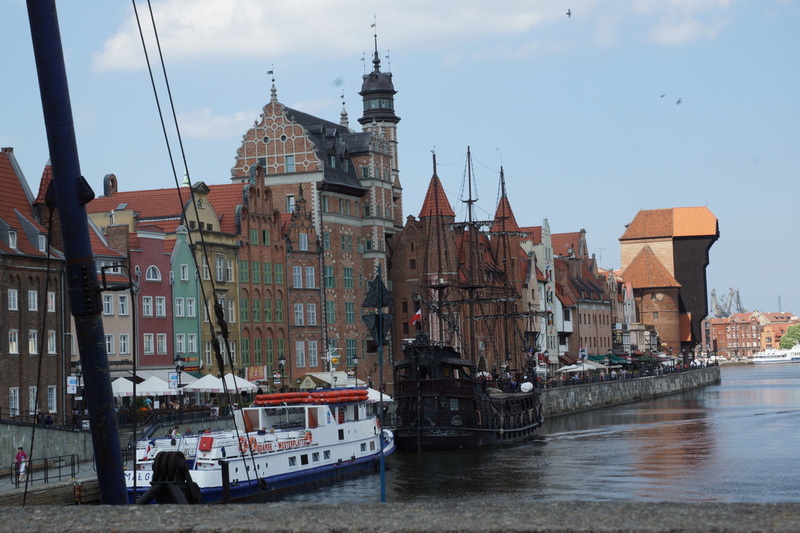 Of course, Gdansk is another Hanseatic port. We got the tram back at the end of the afternoon but it broke down fairly quickly and that's when not speaking the language is an issue. We followed everyone else of the tram and began to walk towards the next tram stop. We opted to walk beside a very busy road rather than on the tramlines but then the next tram came along and we had a four foot wall between us and the tram station, this was a touch challenging for Sheila, those who know her may be surprised to note that she went over it like a mountain goat and got on the tram. 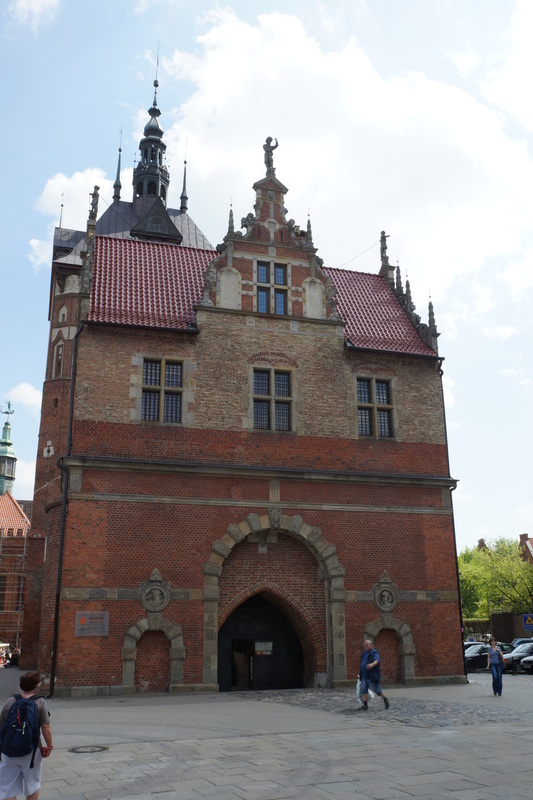 We saw Lech Walesa's office when in Gdansk and actually saw him in Tallinn , but not quick enough with the camera. 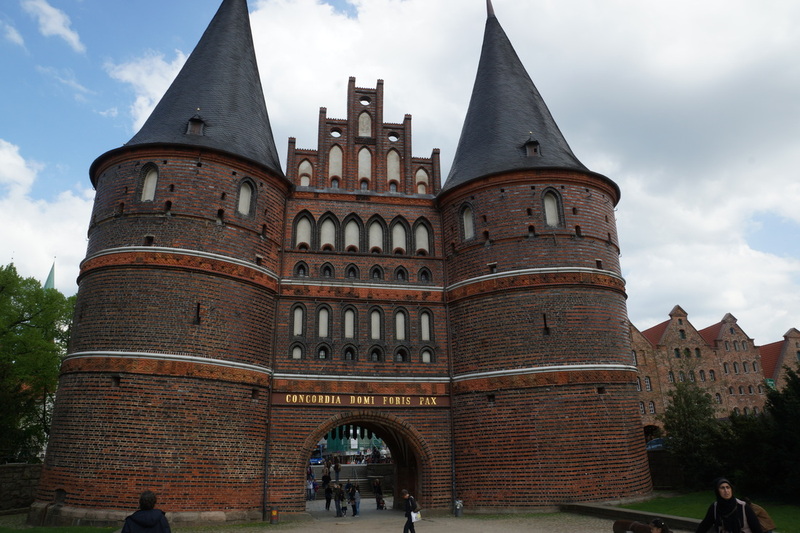 asked Sheila if we were going there, as this conversation was in German which Sheila does not speak the conversation was brief but Sheila looked it up and it is the site of an enormous complex of castles/fortified monastery built by the Teutonic Knights in the C13th and C14th. It has changed hands a few times over the years but is now firmly in Poland. It is clearly a place of pilgrimage for Poland’s schoolteachers because there were hundreds – perhaps thousands – of kids being herded around. It was very good value as well – Zl30 each to get in (€7.50) which included an audio guide. 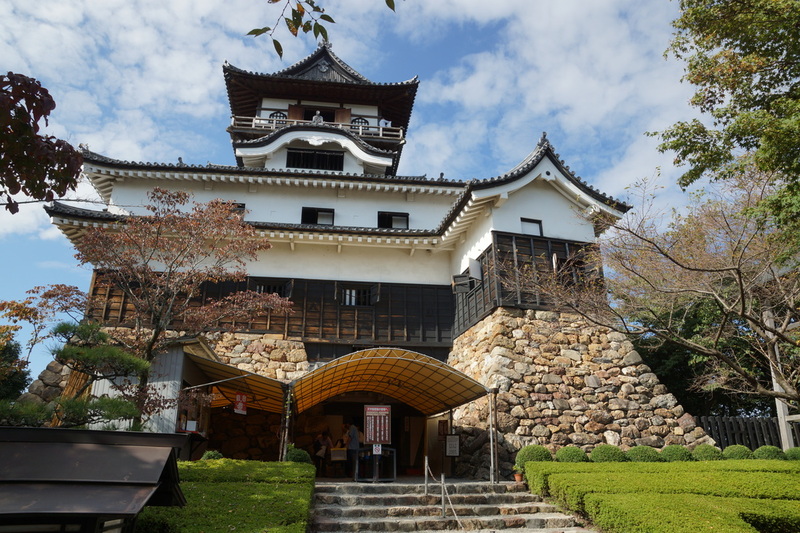 It is a huge and stunning piece of architecture, with some nicely evil metal men in the Middle Castle. Again, this place was very badly damaged during WW2 but there has been extensive restoration since. 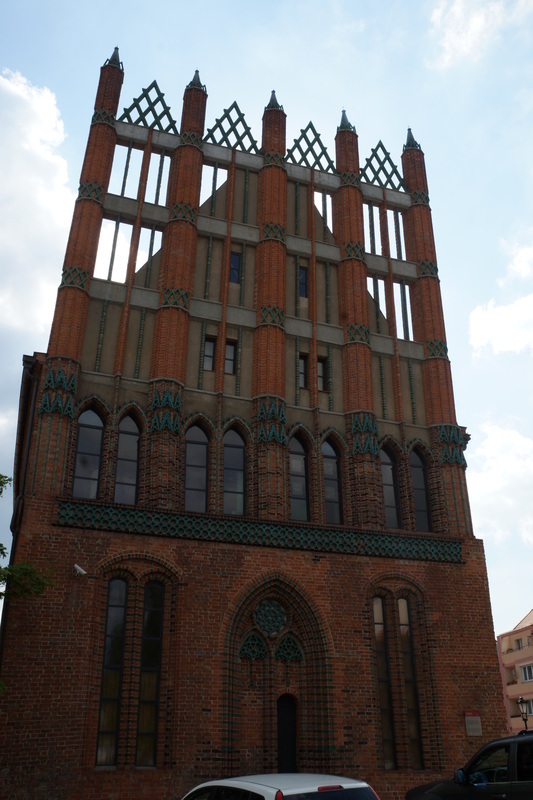 There had been a cathedral within the complex but the bricks were taken to rebuild Gdansk and Warsaw after the war. 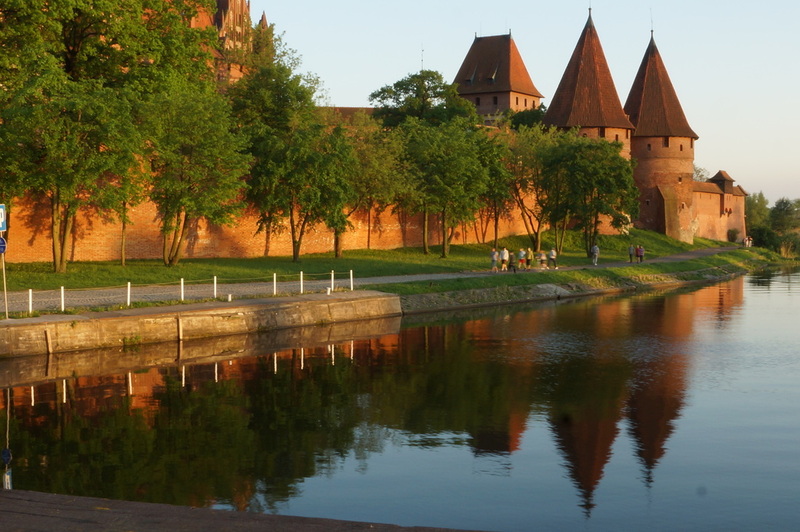 The campsite at Malbork was wonderfully located in a park next to a lake and only a few hundred yards from the Castle. On a post in the middle of the lake a (presumably female) BlackTern was waiting while her mate skimmed the water and brought her food. Our final stop in Poland on this leg of our journey was at the Mazurian Lakes, a vast area covered by a lot of water. Despite our best intentions we settled down at Camping Elixir (Camping Cheque book) and did not stray at all. This was a poor effort on our part - you could spend a couple of weeks in this area as there is much to see and lots of campsites. We had a most enthusiastic welcome from Elizabeth the site owner. She has excellent English having spent more than 20 years in England, and has a Scottish husband Tom. They were pleased to be able to speak English as once again there are not many British visitors. They explained that the place was derelict when they bought it 10 years ago but it is looking good now and improvements continue.The kitchen was being refurbished while we stayed and the Soviet style showers and toilets are due to be attacked later this year. 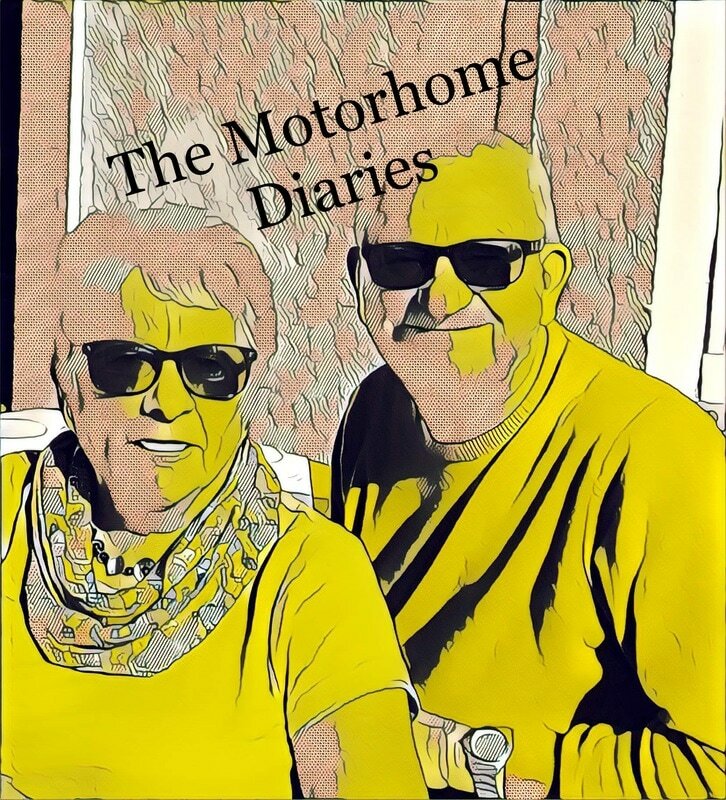 We took the opportunity to relax here – the weather was good and we could get wifi, beer and a meal at the campsite and there was a washing machine too. We also took our new blow up kayak out for its first run and it worked fine except for slight sore hands which we hope we have fixed with a bit of pipe insulator on the paddle handles or by wearing cycling gloves. The pump which we had to pick up at Decathlon as we forgot to bring the right one with us did the job of the blowing upthe whole boat – there are three main sections to inflate, plus two seats – it worked well and had plenty of puff left at the end.